Titanium road bike is the cycling product where the unsurpassed qualities of titanium meet with the ever increasing demands of the ultimate cycling challenge. Of course, what else a road bike should be? Only the ultimate product to harness the human effort and efficiently convert it into speed. And titanium road bike does that, and so much more. The unsurpassed strength-to-weight ratio and the superb physical properties at lower weights give titanium the unique ability to damp road shock while retaining excellent torsion resistance to counteract pedaling loads. Add to that titanium's phenomenally high fatigue strength and the fact that it doesn't rust or corrode, and there's simply no better choice. Many expert cyclers feel that titanium combines the best characteristics of all the other frame materials. It rivals aluminum in weight, is as comfortable as steel and has a sprightly ride and electric handling that many riders swear by. The frames feel "alive," as if each pedal stroke gets a boost from an inherent springiness in the frame. My personal experience in this matter is a bit light, but my friend Daniel is truly passionate about biking and is able to provide a more direct understanding of titanium bicycles. It shouldn't matter if your idea of bicycle riding pleasure is 10 miles around the town or 100 miles around the county, a comfortable, strong and lightweight titanium bicycle frame is good for the body and the mind. These unquestionable characteristics were recognized as back as the 1960 when Speedwell producer from the United Kingdom had some titanium frames manufactured. Of course Lamborghini expertise was needed in order to weld a complete road bike in place, as titanium machining was close to witchcraft back then. 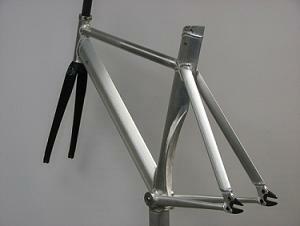 But it was Litespeed that brought titanium frames to a broader market in the 1980s. It is safe to assume that their vision is still functional, and probably the best titanium road bicycles alive these days come from Litespeed. There are different types of titanium alloys used to make titanium road bikes, but I’ve already took care of the matter in the page about titanium bicycles. When ready to purchase a titanium bike you should carefully asses the aspect regarding strength, quality (especially at the welds, welding titanium must be done in a very clean, inert gas atmosphere as contamination from oxygen or nitrogen can severely weaken the weld)and design. In fact, the weld is the most critical part of the frame when it comes to strength. You're not likely to ever see a titanium bicycle frame broken in the middle of a tube, but only at the welds. Always remember the best bicycle is one that fits you and your riding style. Try to look around time-proven concepts - not the latest fads.